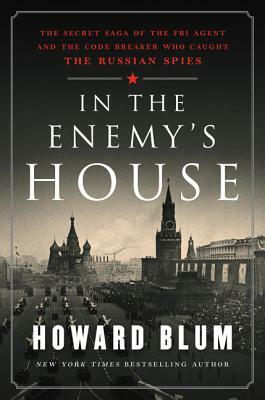 In the Enemy's House: The Secret Saga of the FBI Agent and the Code Breaker Who Caught the Russian Spies (Hardcover) | The working bookstore for the reading class. The working bookstore for the reading class. Seventy-five years ago, as the Nazis were bulldozing through Europe, we and the Brits needed allies. Russia stood to the East. Alliances were formed. Although Russia could hardly be called a friend, it was more a case of "our enemy's enemy". Russian sympathizers were sprinkled all over the U.S. And when word leaked out we were developing "the mother of all bombs" using atomic energy, a somewhat less-than-friendly espionage exploded. Making use of recently declassified documents from both sides, this book is the incredible and true tale of how the Russians absconded with our "atomic jewels". You'll marvel at how an impenetrable fortress of secret coding used by the Russians was vanquished. Walking with Herbert Hoover's band of merry agents as they follow literally thousands of wispy slivers to weave an intelligence tapestry from a tangled web of clues, will leave you in awe. And you'll witness the cascading reenactment of "unmaskings" as traitor upon traitor try to escape detection. The spy ring, nominally led by Julius and Ethel Rosenberg, was ultimately unraveled, but only years later, thanks to an unlikely partnership between an amiable FBI counterintelligence agent and a hyper-nerdy, utterly brilliant code breaker. So the Russians were allies? Fast forward to today. Russian leaders are still at it. Infiltrating our media, even meddling with our elections. Messing with borders in Europe , trying to dissemble the pillars that hold up democratic ways of life around the world. By reading this book, you'll get a better feel for why the past is truly prologue. Just keep telling yourself, "the Russians are really trying to be our good friends." The New York Times bestselling author of Dark Invasion and The Last Goodnight once again illuminates the lives of little-known individuals who played a significant role in America’s history as he chronicles the incredible true story of a critical, recently declassified counterintelligence mission and two remarkable agents whose story has been called "the greatest secret of the Cold War." In 1946, genius linguist and codebreaker Meredith Gardner discovered that the KGB was running an extensive network of strategically placed spies inside the United States, whose goal was to infiltrate American intelligence and steal the nation’s military and atomic secrets. Over the course of the next decade, he and young FBI supervisor Bob Lamphere worked together on Venona, a top-secret mission to uncover the Soviet agents and protect the Holy Grail of Cold War espionage—the atomic bomb. Opposites in nearly every way, Lamphere and Gardner relentlessly followed a trail of clues that helped them identify and take down these Soviet agents one by one, including Julius and Ethel Rosenberg. But at the center of this spy ring, seemingly beyond the American agents’ grasp, was the mysterious master spy who pulled the strings of the KGB’s extensive campaign, dubbed Operation Enormoz by Russian Intelligence headquarters. Lamphere and Gardner began to suspect that a mole buried deep in the American intelligence community was feeding Moscow Center information on Venona. They raced to unmask the traitor and prevent the Soviets from fulfilling Soviet Premier Nikita Khrushchev’s threat: "We shall bury you!" A breathtaking chapter of American history and a page-turning mystery that plays out against the tense, life-and-death gamesmanship of the Cold War, this twisting thriller begins at the end of World War II and leads all the way to the execution of the Rosenbergs—a result that haunted both Gardner and Lamphere to the end of their lives. Howard Blum is the author of the New York Times bestseller and Edgar Award winner American Lightning, as well as Wanted!, The Gold of Exodus, Gangland, and The Floor of Heaven. Blum is a contributing editor at Vanity Fair. While at the New York Times, he was twice nominated for a Pulitzer Prize for investigative reporting. He is the father of three children, and lives in Connecticut. Search results are not a real time indication of in-store stock. Special orders will be filled promptly. We will contact you with any delay or problem.